National Geographic Channel's 'Mars': Does Art Imitate Life? 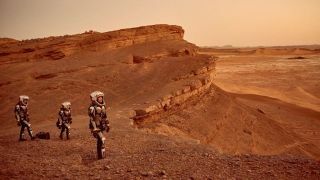 LOS ANGELES — The new National Geographic Channel docudrama "Mars" tells the story of the first human mission to the Red Planet in 2033, while also flashing back to interviews with real people who are working today to make the flight a reality. The series is a work of fiction, but could this be a case of art imitating life? Has 2016 been a pivotal year during which humanity became serious about mounting a crewed expedition to Mars? Mars has been getting a lot of attention lately. In September, SpaceX founder and CEO Elon Musk unveiled an ambitious plan to begin sending astronauts to Mars as early as 2024. And NASA is eyeing human missions to the Red Planet in the mid-2030s. "It's a whole new territory to explore," Bormanis said. "Who wouldn't want to drive a rover through Valles Marineris, or go to the polar caps and go exploring around those areas?" Manning said that the question of whether life ever existed on the Red Planet — and whether it still does today — is a leading motivator for sending humans there. "Scientists would love to go to Mars," he said. "We'd love to go find out. Mars, in fact, could be the next step for the web of life to grow again." David said Mars is the next logical step in the human exploration of space. "I look at Mars as some kind of metaphor for exploration," he said. "I look at it as a metaphor for scientific discovery. I also look at Mars as a metaphor for danger. A lot of work to do — not easy, it's going to be hard, and the challenges ahead are phenomenal. But, I think humans in the arc of exploration — that's exactly where we go. And so that's what I try to capture in the book." Though they're excited by Musk's bold plans to send humans to Mars, David and Bormanis said they have some serious concerns about the effort. "It's the kind of vision that is really exciting for a lot of people," said David, who said Musk's plan harkened back to ones promoted by Wernher von Braun and Walt Disney in the 1950s. "Most of my engineering friends go, 'Nice try. We need more details.'" Part of the reason Musk wants to colonize Mars is to "back up humanity" — making the species much less vulnerable to extinction in the event of a catastrophe here on Earth. Bormanis said he had an issue with that rationale. "I think that's kind of a cynical reason to launch a mission to Mars, in the near term anyway," he said. "There is no urgency to send human beings to Mars in terms of our various social problems, which are many. I think there are great reasons to do it, I hope we do it and I hope we do it soon, but the notion that there's going to be like an asteroid impact or a plague or this, that or the other thing that is going to potentially wipe out human civilization ..."
"Or an election," David interjected, spurring laughter from the crowd. During the year he spent researching and writing his book, David talked to many of the people who are working on advancing Mars exploration. He was struck by their enthusiasm and their inventiveness. "There were days where I'm writing this book and I'm going, 'This is really, really hard, and I don't know if it's going to happen,'" he said. "Then I get a new paper from somebody and I go, 'Oh, they solved that. That's pretty interesting. And there's people working on the problem. Definitely this is hard to do, but it's not insurmountable.'"